Find your perfect pair with the Kitchen Combination, featuring one of our favourite faucets matched with a best-selling sink. The Nola Pull-Down Faucet features an ergonomic dual-function sprayhead and top-quality components for maximum durability. The KHU101 23" Single Bowl Sink is made with premium 16G T-304 stainless steel, and fully soundproofed with NoiseDefend technology. This combo comes with a matching soap dispenser. Experience Kraus Quality, and outfit your kitchen in style. 23 Inch. Undermount Single Bowl SS Sink W/ Pull Down Faucet & SD Stainless Steel Find your perfect pair with the Kitchen Combination, featuring one of our favourite faucets matched with a best-selling sink. The Nola Pull-Down Faucet features an ergonomic dual-function sprayhead and top-quality components for maximum durability. The KHU101 23" Single Bowl Sink is made with premium 16G T-304 stainless steel, and fully soundproofed with NoiseDefend technology. This combo comes with a matching soap dispenser. Experience Kraus Quality, and outfit your kitchen in style. 23 Inch. Undermount Single Bowl SS Sink W/ Pull Down Faucet & SD Stainless Steel is rated 4.7 out of 5 by 7. Rated 4 out of 5 by NYCTulip from Good looking sink & faucet; seems sturdy and well made. Good looking sink & faucet; seems sturdy and well made. Rated 5 out of 5 by Jeffrey from Sinks are great. They're solid so there's... Sinks are great. They're solid so there's no hollow sound like in the cheap ones. Rated 5 out of 5 by JLO from This is a beautiful sink, clean lines, sleek faucet ,... This is a beautiful sink, clean lines, sleek faucet , with a unique deep basket to trap food particles and easy to clean. The package price was better than purchasing the faucet and sink separately. Everything was securely wrapped in styrofoam and arrived undamaged. Love Krause sink! Rated 5 out of 5 by Depotqueen from Very happy with product just making sure that sink size is correct. Had to return for a larger si... Very happy with product just making sure that sink size is correct. Had to return for a larger sink but overall great product and worth the cost. Rated 4 out of 5 by SueTP from Great product at a great value. Bundle made it a convenient purchase. Install was easy. Looks beautiful. Rated 5 out of 5 by Eicowan from Beautiful sink, love the grid and faucet.... Beautiful sink, love the grid and faucet. 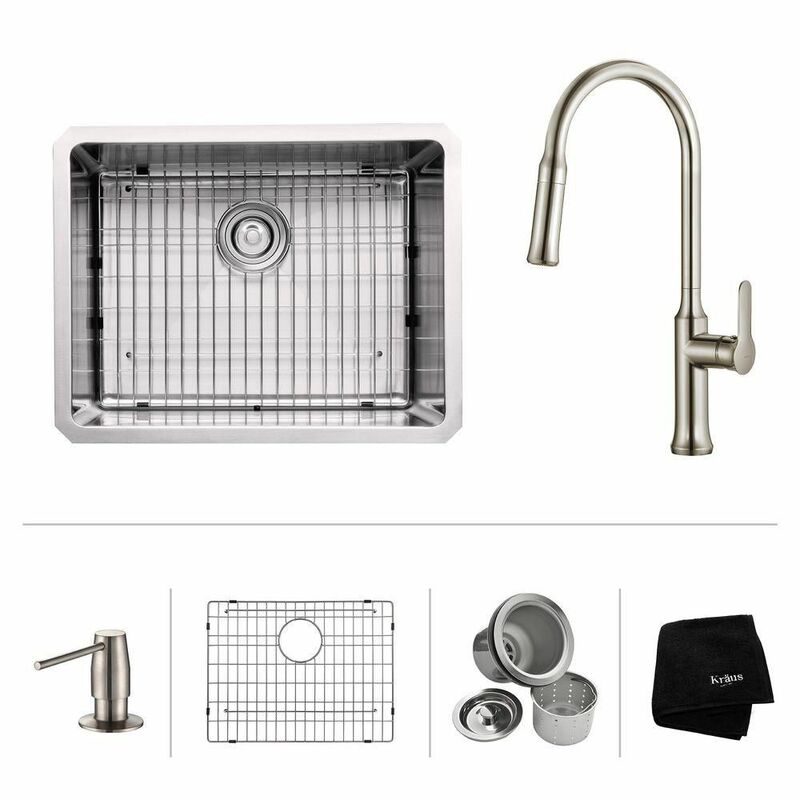 Rated 5 out of 5 by BobKaylaHaus from Kraus all in on deep sink and faucet with accessories... Kraus all in on deep sink and faucet with accessories meets and excedes my expectation. Heavy duty, well made, and expertly finished. I would recommend the all in one for consideration by those interested in quality.